A man who called for the killing of British troops has been found guilty of stirring up racial hatred at a rally. Mizanur Rahman, of Palmers Green, north London, was arrested after a protest at the UK's Danish Embassy over cartoons depicting the Prophet Muhammad. The cartoons had been published by newspapers in Denmark and other European countries. The Old Bailey jury was unable to reach a verdict on a separate charge of inciting murder. The jury had spent two days considering the charges. Web designer Rahman, who had denied both charges, has been remanded in custody while the prosecution decides whether there should be a retrial over that charge. 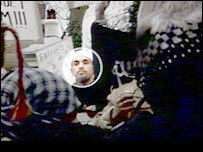 During the trial Rahman apologised for his words on the day of the protest, saying felt "almost ashamed". "I didn't think anyone would take me seriously," he told the court. The 23-year-old was arrested after a rally in London on 3 February which was attended by some 300 Muslims. The Old Bailey heard he addressed the protest on the issue of UK troops in Iraq, saying: "We want to see their blood running in the streets of Baghdad." David Perry QC, prosecuting, told the jury Rahman had also called for more 9/11-style attacks. "What he said was this: 'Oh Allah, we want to see another 9/11 in Iraq, another 9/11 in Denmark, another 9/11 in Spain, in France, all over Europe'," Mr Perry said. 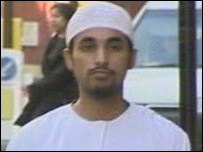 The prosecution said Rahman was filmed calling for troops to be brought back to the UK in body bags. He was also photographed holding placards which said: "Annihilate those who insult Islam." In his defence Rahman said he had no intention of anyone carrying out the actions he called for. His counsel, John Burton, told members of the jury it was not enough for them to be "offended, shocked and distressed" by the comments. "It is a matter of whether a serious crime has taken place," he added. Mr Burton likened the defendant's comments to those heard at Speaker's Corner in London's Hyde Park. The case has been adjourned until Monday for the Crown to consider its position. Meanwhile, Labour MP Shahid Malik, said he was "extremely pleased" at Rahman's conviction, adding it was "a good day" for community relations. The Dewsbury MP said: "I'm very satisfied with the verdict and hope that it will send out the signal that whilst we may indeed be fortunate enough to live in a free society, it does not give people the freedom to stir up racial hatred, and that those who do so will be dealt with the courts accordingly."